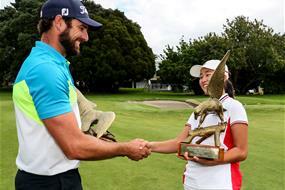 Daniel Pearce has won his third Jennian Homes Charles Tour title by claiming the Barfoot & Thompson Akarana Open by three shots this afternoon at the Akarana Golf Club. Pearce showed his experience this week with rounds of 66, 64, 66 and a composed 65, to hold off defending champion Gareth Paddison who finished in outright second. 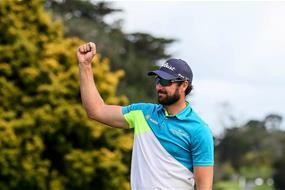 This also means the 29-year-old has recorded back to back victories on the Jennian Homes Charles Tour, with the last event being the Ngamotu Classic in October 2017, which he also won in convincing fashion. “It’s a great feeling! Winning is always fun and puts a smile on the face, so it was a good day out there today,” said Pearce. It was his iron play that stood out this week as he played the extremely challenging par three’s in fine style, which are the strength of the Akarana Golf Club. With this comes more than just prize money, as Pearce earns valuable points for the season long race to the Jennian Homes Trophy which will be decided in two weeks’ time at the Carrus Open. After recording two wins in three events, he now takes a commanding lead as the Hawkes Bay professional looks to complete a bumper summer in style. The 2018 Akarana Open will also be remembered for the amateur talent on show with 15-year-old Jang Hyun Lee equalling a course record of 61 in the second round, followed by Kevin Koong’s consistency to finish alongside Lee in a tie for third place. 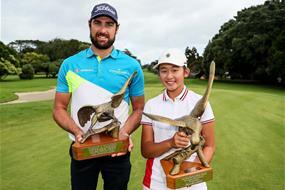 Vivian Lu has gone wire-to-wire to win her maiden Jennian Homes Charles Tour event at the Barfoot & Thompson Akarana Open after fending off a courageous Darae Chung to win on the 72nd hole. Lu set up her week with a superb opening round of seven-under par, but had to finish things the hard way as Chung slowly caught her to co-lead entering today’s final round. Lu then took control throughout the day before an amazing up and down from the trees by Chung squared things up coming down the last hole. The trees weren’t so forgiving on the 18th as they swallowed the 13-year-old’s ball which forced a drop, ending her challenge. Our newest winner on the national circuit was very satisfied with her week and will take a lot of learnings from it. “It feels amazing, I’m very overwhelmed because I started off well, but struggled in the second and third rounds,” said Lu. Although the Auckland amateur is unable to receive prize money, she walks away with a new Iphone after her Dad had a slip of the tongue which she cashed in on to claim the biggest victory of her career. Chung who ended the week two-shots behind will mark this down as a hugely successful week as the 13-year-old continues to grow. In third place was former champion Brittney Dryland who was unable to repeat her 2016 efforts to finish with a tough final round of two-over. We now pop down the road for the second of three events to finish the 2017/18 summer with the Autex Muriwai Open starting this Thursday where Dan Pearce will be looking to repeat the efforts of Gareth Paddison who won both the Akarana and Muriwai Open in consecutive weeks last year.